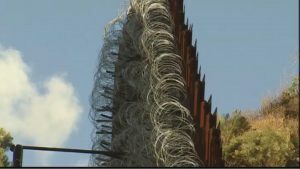 NOGALES, Ariz. (KVOA/NBC News) – Less than a week after President Trump ordered troops to start putting razor wire along existing sections of order wall, one town in Arizona is demanding it be taken down. On Monday troops began placing concertina wire along the wall in Nogales. On Wednesday, the Nogales City Council adopted a resolution calling on the federal government to remove the wire. One tourist visiting from Michigan Wednesday compared the sight of the wire to a prison camp, and city leaders contend the sight of the wire is already harming the economy.